7 i n c h e s: Reference Desk / Beached Out self released split 7"
Reference Desk / Beached Out self released split 7"
NYC is a small enough world once I start making connections between band members so when I noticed that these two bands, Reference Desk and Beached Out were both from Halifax I couldn't help but think they must have crossed paths with Dog Day one of my favorite bands. I have no proof whatsoever that they could have ever played a show together but both of their approaches to these tracks feels strangely familiar in their reverence for post punk and insanely catchy pop which they must have been born with and are two more examples shining the light on the Canadian north. 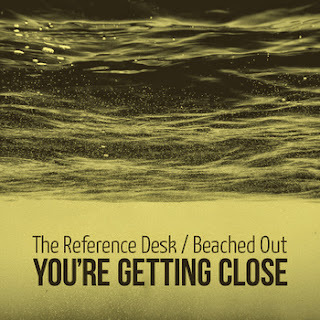 The Reference Desk started out as a guitar/ drums duo before adding bass to the trio they play as now. Tight crunchy guitar blasts away on "Try Not/Try To" with four chords and an even tighter vocal harmony that reminds me of a Weezer production. Slipping into a higher falsetto with a similar slide from the rhythm section this has that saw blade post punk that tries as hard as it might to be smooth and peppy but comes off as nervous and looking around the room - is anyone checking this out? You really should, it's simple and they don't rely on tricks with the amount of vocals happening here. Sinple and intimate, letting you in on this pop secret. There's a great party with normal volume music and people just hanging out and these guys are there. It's that simple. "When You Drown" is a slower dirgeish melody of piled up shoegaze sonics, the guitars working on separate plains. The vocals are like Latimer House, a super pop style miles apart from the rest of the instrumentation. These background drums are forced to bash away at that snare adding to this opressive kind of drowning. Except they take the opportunity to still manage a false step, that almost falling stop start. Still tiny and intimate like its happening between your ears, the sound is almost happening just a few feet away from you with hints of English twee and layered shoegaze but mostly jangly underground indie. Not as shredded or dense as Something about Airplanes but still referencing that style. Less dreamy, more straightforward and direct. An accountants version of Loveless. Beached Out is the rarest of band duo's, the married kind. God Bless you couples that can endlessly tour and come to agreement on song arrangements. Jeff on guitar and Anne on drums are making the whole thing seem endlessly fun like you know it could be in those rare situations. On "Tiny War" it sounds like there's a weird drum machine under these real drums, or is that triggers? These guys push this minimal punk sound even further; the guitar is Joy Divisioned out with a metallic reverb and the drums are walking into the session, leather jacket in hand. It's dark and getting all the individual pieces to take their places. Guitar harmonics are underused, it's hard to get that exact strike for the extra tones but these two have that crazy pop attention to detail. Massive cymbal bashes like a glittery explosion in the middle of this coldness. "Bad Breaks" has a tight electronic click under the snare and I love these sounds they're getting, the big vocals along with those manipulated drums. Super confident and darker than the Drums or Mates of state. A sunny guitar melody with a twitchy drum sound and Jeff on vocals is joined by Anne who breaks apart this melody and elevates it into Blouse areas of detachment. I love when a band can also blow out a minimal ultra constructed sound like this. It's like a titanium cube you carry around like a security blanket. Everyone does that right? Both of these sides are really great, record labels, these guys need those bigger records. Get it from Reference Desk direct or Beached Out.